Who says a grilled cheese is just for kids? This Grilled Cheese and Prosciutto Panini from renowned Chef David Burke offers a bit of elegance for a simple sandwich recipe, garnished with a light side salad. 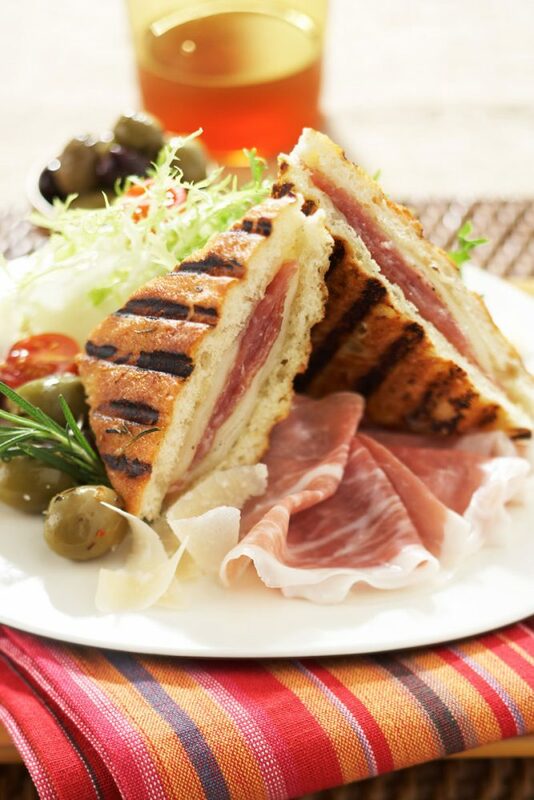 Have this prosciutto panini as a lunch-time favorite or cut it into smaller pieces for an appetizer. The savory Prosciutto di Parma and melted Parmesan cheese is perfectly balanced by a slightly bitter but smooth pilsner or even a light Belgian wheat beer. Take a look below for a quick grilled cheese how-to video by Lucie Fink. In a small saucepan, heat oil. Remove pan from heat; add rosemary and set aside until mixture reaches room temperature. Cut a 3/8-inch slice from the top and bottom of each foccacia square; brush all sides with rosemary oil. Set aside remaining olive oil and the middle slices of the foccacia for another use. On the bottom slice of each foccacia, alternately layer provolone, Prosciutto di Parma (using 8 ounces total for the panini), dividing equally; cover with top foccacia slices. Grill foccacia sandwich until browned on both sides and cheese has melted slightly, 3 to 4 minutes per side. To serve, cut each panini in half diagonally. Place in the center of a plate. Garnish with frisee endive, olives, tomatoes, Parmigiano-Reggiano shavings and remaining 2 ounces Prosciutto di Parma. Looking for the perfect beer to pair with this dish? Check out our beer pairings page to learn more.